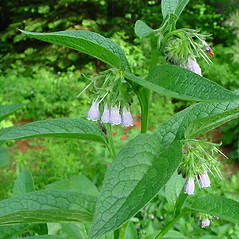 Common comfrey is found escaped from cultivation in all New England states. 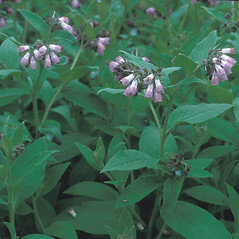 A sterile cultivar is frequently planted in gardens, somewhat reducing the probability of escape, although it easily spreads from root fragments. 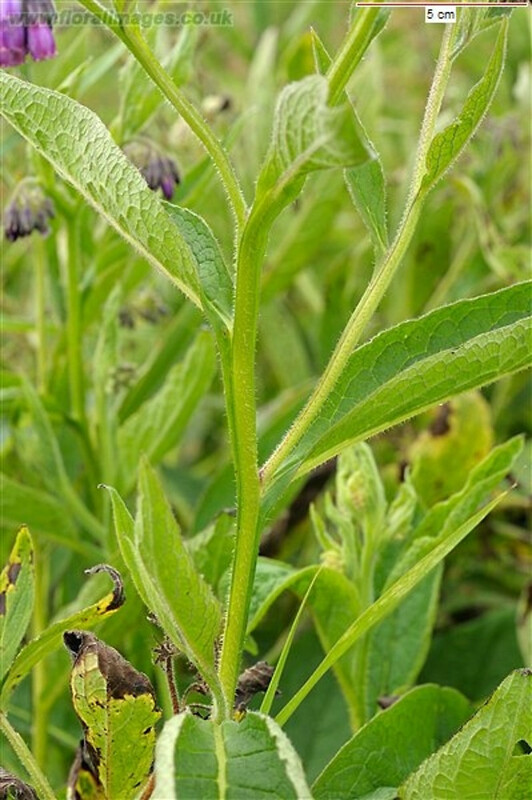 Its use as a medicinal herb is controversial as it is known to contain toxic alkaloids. 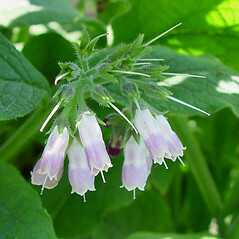 However, it is most frequently used topically for compresses and salves. 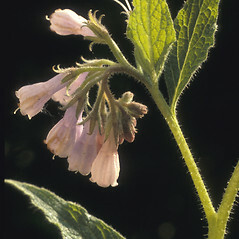 leaves not decurrent, mericarps tuberculate-roughened, and corolla pale yellow (vs. S. asperum, with leaves decurrent as wings on the stem and branches, mericarps smooth, and corolla pink to red-blue). 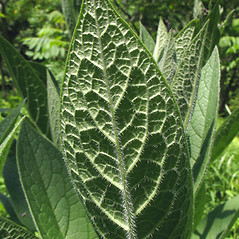 leaves not decurrent, mericarps tuberculate-roughened, and filaments narrower than the anthers (vs. S. asperum, with leaves decurrent as wings on the stem and branches, mericarps smooth, and filaments nearly as wide as the anthers). 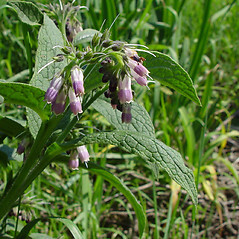 common comfrey. 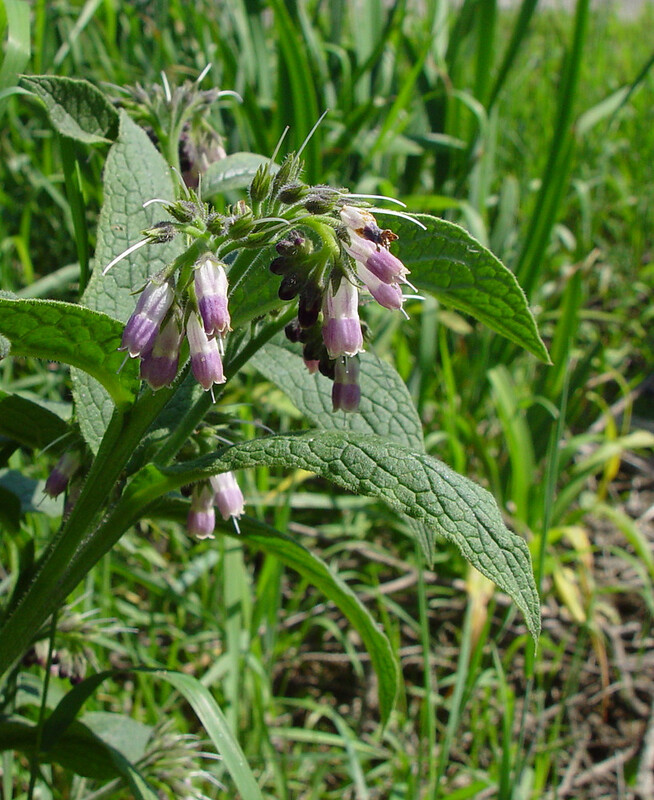 Symphytum officinale L. ssp. 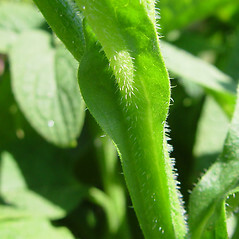 uliginosum (Kern.) 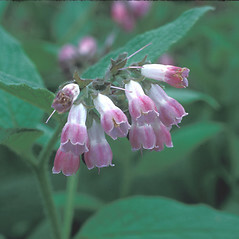 Nyman; S. tanaicense Steven; S. uliginosum Kern. • CT, MA, ME, NH, RI, VT. Roadsides, ditches, former homesteads, gardens. 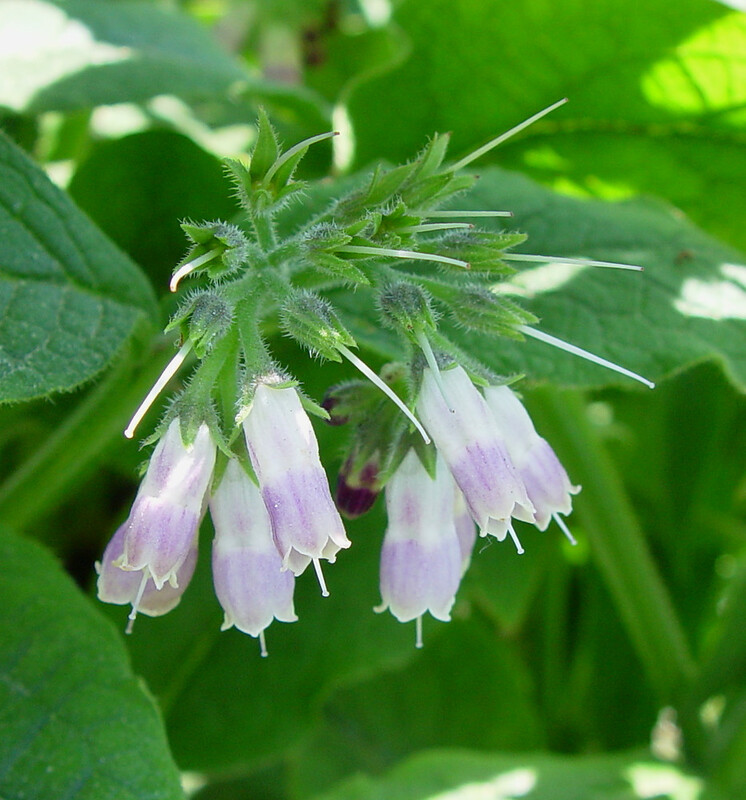 At present their appears to be two cytotypes of Symphytum officinale that may warrant recognition at some level. 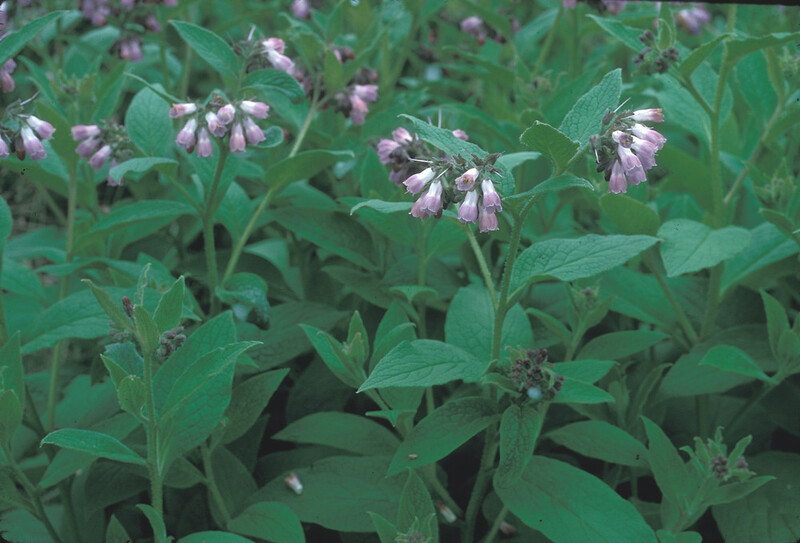 The 2 n=24 or 48 type (diploid and tretraploid, respectively) appears to be the common form in New England. 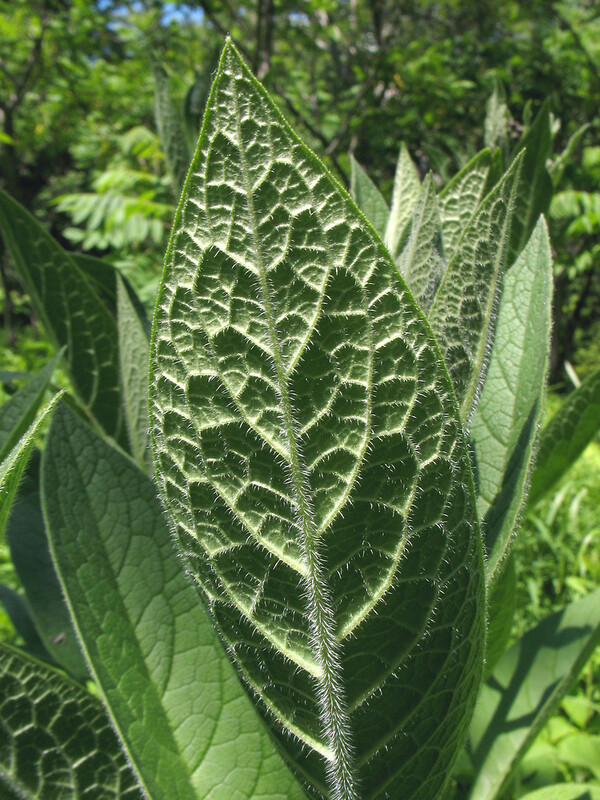 It shows hispid stems that are not harsh to the touch, leaves with prominent decurrent wings, marginal setae of the sepals distributed in an irregular pattern, and white (usually diploid) or purple (usually tetraploid) corollas. 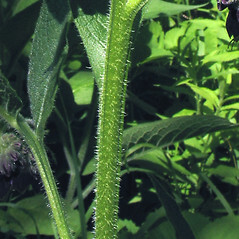 The 2 n=40 type, known from North America but yet documented in New England, has tuberculate-based hairs on the stem that are harsh to the touch, leaves with shorter decurrent wings, marginal setae of the sepals distributed in a uniform manner, and purple corollas. This latter cytotype has been named ssp. 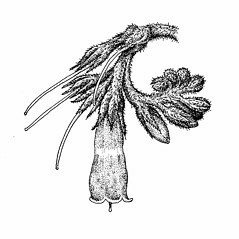 uliginosum (or S. tanaicense at the rank of species). 1×2. 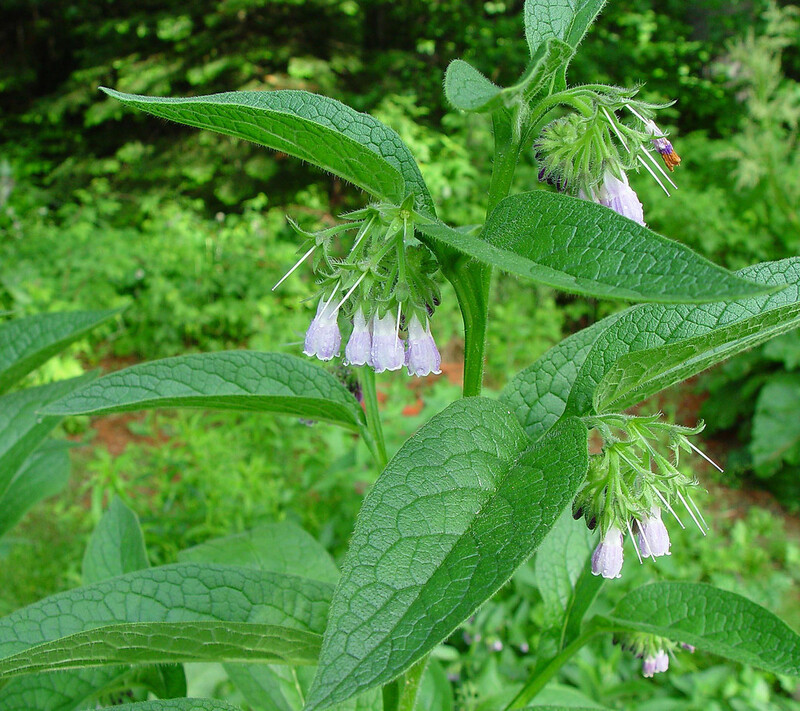 Symphytum asperum × Symphytum officinale → Symphytum ×‌uplandicum Nyman is a very rare comfrey hybrid in New England known from CT, VT. 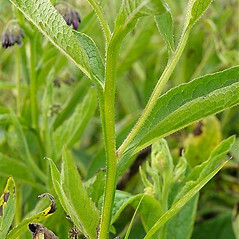 It resembles S. asperum in that the leaves are not decurrent on the stem (or infrequently shortly decurrent for a distance of less than 10 mm). 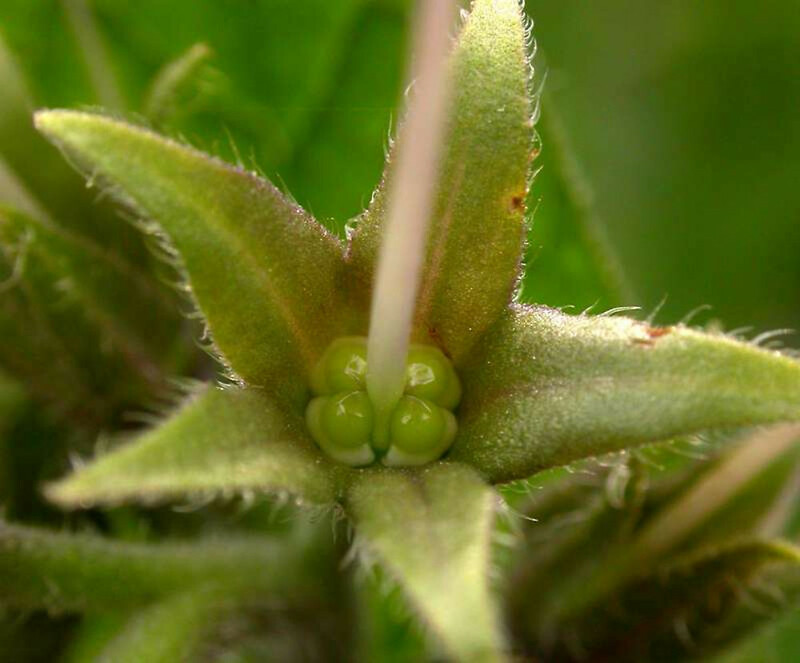 However, the hybrid differs in that it has a corolla 13–16 mm long, purple or pink flower buds, a calyx 5–7 mm long, and short, broad papillae on the margins of the fornices (vs. corolla 9–14 mm long, red flower buds, calyx 3–5 mm long, and long, narrow papillae on the margins of the fornices). 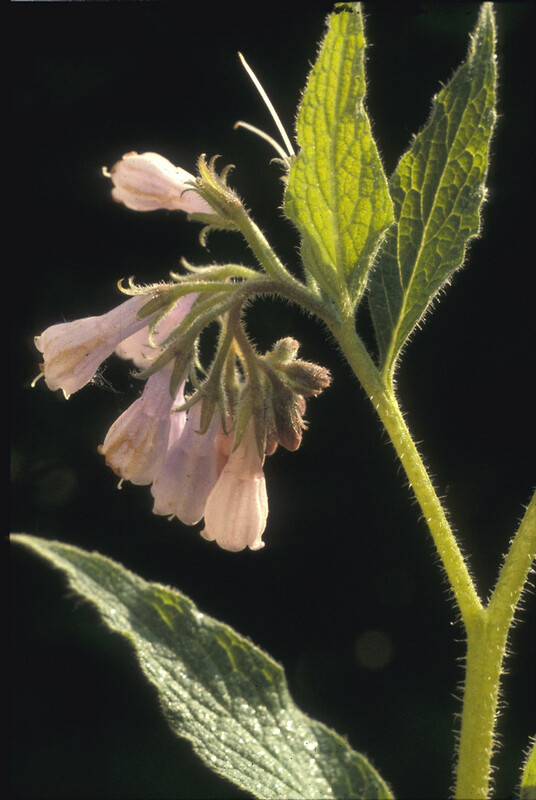 From S. officinale it can additionally be distinguished by ascending corolla lobes and dull brown schizocarps (vs. recurved corolla lobes and lustrous black schizocarps). 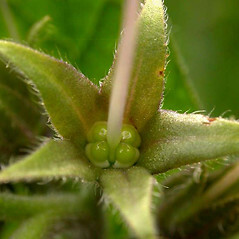 Two cytotypes of this hybrid are known, depending on which cytotype of S. officinale was involved in the cross (see discussion under S. officinale). 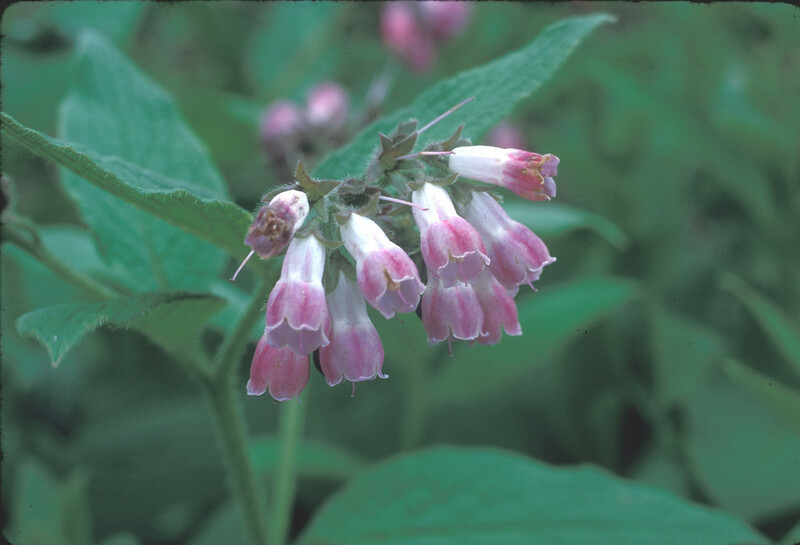 Thus far, only the 2 n=40 type of this hybrid has been collected in New England (with a 2 n=48 S. officinale parent). This hybrid shows softer stem pubescence, slightly longer leaf base decurrence (on average), and blunter fornices than the 2 n=36 type (which is known from North America).